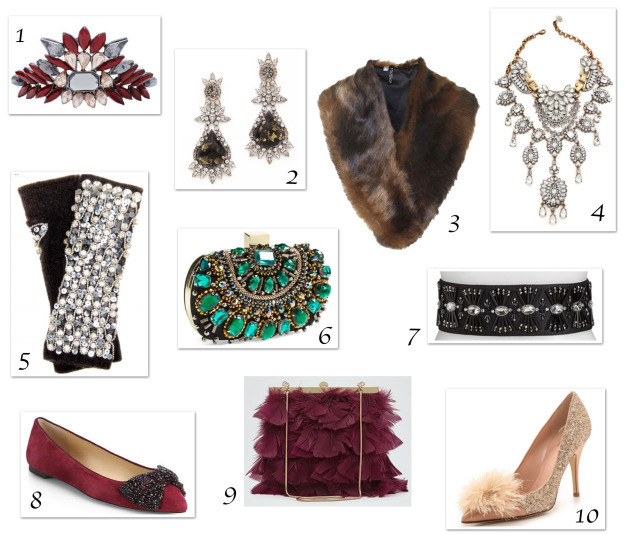 The holidays are coming like a bullet train and now is the time to refresh your “party” wardrobe! Assess your closet and update your accessories stash so you are ready for the deluge of holiday luncheons, kids’ performances, holiday teas and cocktails with the girls, holiday fetes and family dinners. Not to mention, there are always last-minute invitations that crop up. Having a couple of go-to flattering and perfectly-festive ensembles pre-styled with eye-popping accessories in your closet will help take the stress out of dressing and you can avoid the all too common “I-have-nothing-to-wear” syndrome. Here are 10 droolworthy accessories and adding even just one of them to your collection will help update and transform your party style!